Enjoy this Press archive of Lara's articles and interviews to enhance and inspire your yoga lifestyle. Lara Alexiou's wellness articles have appeared in New Age Journal, Creations Magazine, LifeZette, Travel to Wellness, Holistic Healing News and Bloomer Boomer. Public Health Education Series Part of a 12 part series, the purpose of this program is to provide the public with useful and easy-to-understand information on a variety of health issues and advances in medicine to prevent and treat diseases and conditions. ECTV, together with Luzerne County Medical Society and Lackawanna County Medical Society featured SHY during their segment on post holdiay wellness. Their host Laurie Cadden visitied the studio. Become the Architect of Your Body, Mind, and Soul, Lara Alexiou's debut book, is a featured item in the Yogi Surprise Spring Equinox Box! Order your limited edition copy while supplies last. March 21, 2017. Just in time for the Spring Equinox, Lara and Julia are at it again on the Stepping Into the Light Podcast. The topic is how moving your body is directly related - and necessary - for getting into the flow of the Universe and getting yourself "unstuck" in the daily grind. Enjoy the the audio podcast or the video version. Use these pointers to get started and discover for yourself how yoga relieves stress, alleviates chronic pain, and amplifies joy. Read the full article here. Released Feb 19, 2018: Stepping into the Light Podcast host, Julia Treat, talks with Lara Alexiou about the benefits of hot yoga. Julia recalls her battle with Lyme Disease and how adopting a hot yoga practice helped her heal her body, mind, and spirit. Julia continues to practice hot yoga on a regular basis and encourages others to try it as well. Take a listen and learn the healing benefits of hot yoga. Please share this podcast! And be sure to give Julia some stars and a review. Thanks for listening! Feb. 12, 2018: Check out Lara's interview on Courtney Bentley's, Fit, Fierce and Fabulous Podcast. Lara talks about emotions - the happy ones and the not so happy ones - and how to manage them all to experience life to the fullest. Making a New Year's Resolution? Here's how to Keep it. BY Terrie Morgan-Besecker/ Published: January 1, 2018. February 6, 2018: Julia Treat, host of Stepping into the Light Podcast, interviews owner Lara Alexiou. Julia has been a SHY student for almost a decade and successfully uses her Hot Yoga practice to control Lyme's Disease. January 1, 2018: Yoga teachers at Steamtown Hot Yoga told Newswatch 16 that hot yoga can help release the tension that comes along with the cold weather and the holidays. Dec. 22, 2017: Awake 2 Oneness Radio interview with Lara Alexiou on her debut book, Become the Architect of Your Body, Mind, and Soul. July, 2017: The quote “To all the seekers: May you discover the answers are within” is in the inside cover of Lara Alexiou’s terrific book – Become The Architect of Your Body, Mind, and Soul. The Business Builders Show is proud to present Lara Alexiou on C-Suite TV: www.c-suitetv.com. July 1017: Lara Alexiou was a featured workshop presenter for the National Qigong Association Annual Conference with the topic: Tao of Meditation with 5 Element Music. Her workshop featured original music composed by Lara's Master Teacher Jason Campbell. August, 2014: This talk was given at a local TEDx event, produced independently of the TED Conferences. Lara Alexiou gives a personal story about her experiences with the body as a structure which can stand strong or crumble. Certificate recognizing Lara Alexiou's 10,000 Hours of Taoist Qigong and Meditation Practice. Lara Alexiou presented a workshop on the business of yoga. Lara Alexiou attened the festival with the Papyrus Trinity Star. 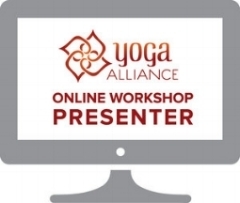 Lara Alexiou is a recurring workshop leader at the annual NEPA Yoga Festival. By Peter Cameron, Staff Writer, March 12, 2017. Almost four years after John and Lara Alexiou moved their yoga studio from the East Mountain to downtown Scranton, they have doubled the number of offered classes, tripled their staff and expanded their membership fivefold. Body and Soul Connection of Yoga Healing with Lara Rubin Alexiou on Awake 2 Oneness Radio, September 25, 2015. "I began practicing Hot Yoga two months ago and met an incredible women, Lara Alexiou. She is the owner of Steamtown Hot Yoga in Scranton, PA. What is so amazing about Lara is she was diagnosed with Multiple Sclerosis (MS) in 2003 at the age of 25 and at that time she could barely walk up a flight of stairs. The reason Lara's story resonates so deeply with me is because my daughter was also diagnosed with MS the exact same year when she was only 23 years old," Caroline Chang, Awake 2 Oneness Radio host. In 2015, Lara Alexiou was recognized in the Top 25 Women in Business by The National Association of Women Business Owners and the Northeast PA Business Journal. By David Falchek (Staff Writer), April 13, 2013.